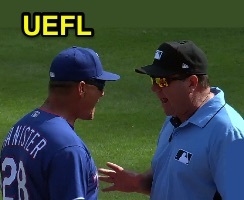 3B Umpire Sam Holbrook ejected Rangers Manager Jeff Banister (no-stop balk call; QOCY) in the top of the 9th inning of the Astros-Rangers game. With two out and two on (R2, R3), Rangers pitcher Keone Kela delivered a 1-2 pitch out of Set Position without stopping once coming set in contravention of Rule 6.02(a)(13), originally no-called (alternatively, ruled a ball and no-swing) and reversed to a balk upon Crew Consultation at the request of Astros Manager AJ Hinch. Replays indicate that after receiving signs in stretch, Kela did not discernibly stop prior to delivering the ball to batter Evan Gattis from Set Position, the call was correct. * At the time of the ejection, the Astros were leading, 8-7. The Astros ultimately won the contest, 8-7. This is Sam Holbrook (34)'s first ejection of 2018. Sam Holbrook now has 0 points in the UEFL Standings (-4 Prev + 2 MLB + 2 Correct Call = 0). Crew Chief Sam Holbrook now has -1 points in Crew Division (-2 Previous + 1 Correct Call = -1). *Rule 6.02(a)(13) states, "It is a balk when—The pitcher delivers the pitch from Set Position without coming to a stop." This is the 56th ejection report of the 2018 MLB regular season. This is the 24th Manager ejection of 2018. This is Texas' 2nd ejection of 2018, T-3rd in the AL West (LAA, SEA 3; HOU, TEX 2: OAK 0). This is Jeff Banister's 2nd ejection of 2018, 1st since May 17 (Paul Nauert; QOC = N [Balls/Strikes]). This is Sam Holbrook's first ejection since September 3, 2017 (Carl Willis; QOC = N [Balls/Strikes]).